Matt Gaser, award-winning illustrator and visual development artist, has worked at Klasky Csupo as a Background/Prop Designer for the animated series Rugrats, and for Lucasfilm on the CG animated TV series Star Wars: The Clone Wars. More recently, he’s been a concept designer on The Angry Birds Movie and is currently in development on the animated feature CUPID with Justin Bieber. 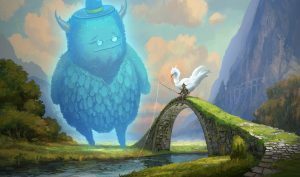 Matt also is working on a fantasy children’s book series which will be published by Chronicle Books as a two book deal. During the presentation, Matt will cover some of the highlights of his career creating imagery for television and film, and talk about creative dreams, setting goals, and how to build momentum with your personal projects. The talk will conclude with a few of Matt’s fantasy stories told through visuals, and Q & A.